Sales and profitability are still headed downhill at Sears Holdings, and the company is running out of assets to sell as it tries to stave off bankruptcy. Bizarrely, Sears Holdings (NASDAQOTH:SHLDQ) stock has more than doubled since early February despite mounting evidence that the company is stuck in a death spiral. However, last Friday, Sears gave investors even more reasons to run for the hills. First, Sears revealed that sales have continued to plunge since the beginning of fiscal 2017. It also provided ugly earnings guidance for the first quarter. Furthermore, another top executive just bailed out. And to top things off, it looks as if Sears' real estate monetization efforts are losing steam. During 2016, Sears Holdings' comparable-store sales declined 7.4%. In theory, this performance should create easy comparisons for the company in 2017. But in the past few years, sales slumps at Sears have typically been followed by even deeper declines. Sure enough, in Friday's update, Sears stated that comp sales have plunged 11.9% since the beginning of the year. As a result -- and despite the company's massive cost cuts -- first-quarter adjusted earnings before interest, taxes, depreciation, and amortization (EBITDA) will be negative $190 million at best, and perhaps as low as negative $230 million. Those figures compare with negative $181 million in the first quarter of 2016. Sears is on pace to post another big loss this quarter. Image source: Sears Holdings. Of course, adjusted EBITDA excludes various costs. The fact that adjusted EBITDA remains deeply negative means that Sears has probably continued to hemorrhage cash this quarter. Given the depth of Sears' woes, it's perhaps not surprising that CFO Jason Hollar recently stepped down after less than a year on the job. There's not much a CFO can do to stop the bleeding at Sears if the company's revenue continues to plummet. In light of Sears Holdings' plunging revenue, the company has increased its cost-cutting target for 2017. Sears now hopes to reduce costs by $1.25 billion on an annualized basis. Some of these cost cuts come from common-sense moves such as closing money-losing stores and reducing overhead. However, some of Sears' cost cuts aren't likely to boost its profitability in the long run. For example, Sears is closing 92 underperforming pharmacies in its Kmart stores. Doing so might save money, but it will also further depress store traffic at those locations. Sears is also closing or downsizing some stores on high-quality real estate that are then being "recaptured" by Sears Holdings spinoff Seritage Growth Properties (NYSE:SRG). These stores are probably quite profitable, since they're in high-traffic locations. The lost profits will outweigh any cost savings from the store closures. In effect, Sears Holdings is finally starting to pay the price for its 2015 deal to sell 266 stores to Seritage. While Sears received a cash windfall of $2.7 billion, Seritage now has the right to evict it from numerous high-profile locations in favor of higher-paying tenants. Sears Holdings' update on its real estate activities was perhaps the worst piece of news for investors. In the past few years, through the Seritage deal and various smaller transactions, Sears has raised billions of dollars by selling off real estate. However, it's starting to run out of valuable properties to sell. As recently as February, Sears raised $105 million by selling three stores, for an average of $35 million per property. By contrast, the company said on Friday that it has bids totaling over $700 million for more than 60 properties it's marketing -- an average of $12 million or less per store. Sears has fewer than 400 owned properties left, and it hopes to raise at least $1 billion from real estate sales this year. It may need to sell 20%-25% of its remaining real estate portfolio to reach that goal. Sears Holdings' vast real estate portfolio has given the company plenty of breathing room to turn its business around. However, it has squandered the opportunity. Sears continues to burn cash at a rapid rate. 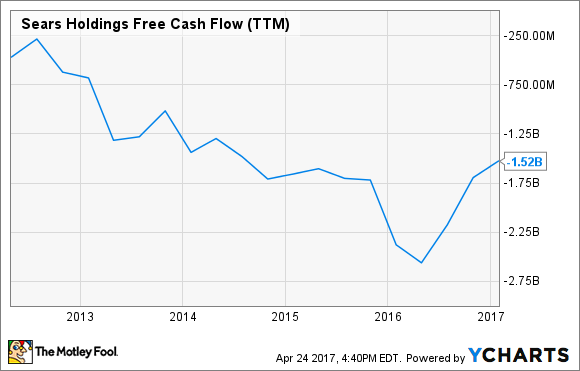 Last year, free cash flow was negative-$1.5 billion. Despite its troubles, Sears isn't likely to declare bankruptcy this year. In the first several weeks of 2017, Sears increased its liquidity by nearly $600 million, mainly through the sale of its still-popular Craftsman brand. Its planned real estate sales will give it even more breathing room. However, Sears will find itself back in dire straits by this time next year, with fewer assets left to sell off. Within two or three years, the company could be forced to declare bankruptcy. By the time that happens, there may not be anything left at Sears worth saving.